"Tokyo lives in the future" is what I said when I landed in 2008. A month later, the iPhone 3G was introduced. Those are my views on a changed future. This is a quick first-impressions review of Layar 2.0, an augmented reality app released for the iPhone 3GS by sprxmobile [iTunes – free]. For starters, this app is very cool, and definately has the “Wow – we’re living in the future!” factor. 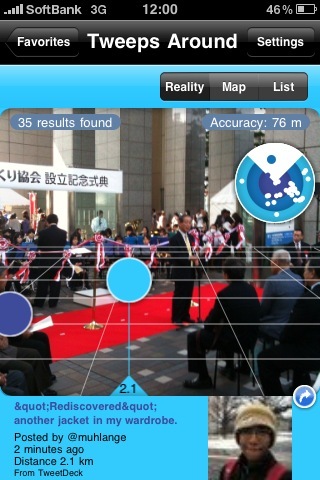 It far surpasses the AR apps released by Presselite (Bionic Eye Tokyo, Tokyo Metro) mainly due to the fact that it has a myriad of data sources – the primary ‘layar’ plugging into Google Local Search, thus enabling it to draw from a wealth of existing reviews / photos / location and contact details. Other layars already available include Twitter, Flickr, Wikipedia, Panoramio – plus many more localised layers (the Layars displayed will be local to the country that you have your iPhone set to in International settings, or you can manually set the location in the app’s own settings panel). Here in Japan you’ll currently be offered find ATM guides, station guides, Hot Pepper, a hair salon search and more. The user interface is a refreshing break from that adopted by Sekai Camera and the afore mentioned Presselite apps. The manner is which their airtags float around is ‘cool’, but not very practical. It’s far easier to navigate the 3D grid laid out before you in Layar. This is of course an extremely young market, so expect to see rapid developments over the next few months. It’s great to have some more companies entering the arena with different approaches to UI etc, and it’ll be interesting to see if any one of them comes to dominate the market. Ok, let’s see some screenshots. The primary layer is ‘Layar Local Search’ which utilises Google Local Search. Just enter your search term. As with Google, you can enter your search terms in Japanese or English. You also have the option to define the the spread of your search. Customer reviews, directions / contact details, photos, it’s all there. Click on ‘take me there’ and the route will be plotted for you on the Google map. Of course, much of this functionality is native to the iPhone’s Google Apps map – but the seamless integration with the AR makes it far more attractive. So what about the Twitter Layars? I tried two out, with similar results. So here we have Tweeps Around in AR mode. The light blue blob indicates the current active tweet, and below you have the tweet itself with the avatar. The cool thing is, is that as you turn around, the highlighted tweet changes – so you feel that you’re kind of scanning the air for tweets! At this point you are officially living on a Star Trek set. You can switch to map view too of course – here we see that in Tweetmondo. It soon picked up a couple of photos I took near the station the other day. Layar is a fantastic AR app, and provides a nice cross-over between the closed database approach of Presselite and the user-generated content of Sekai Camera. I believe the layer approach is a winner, opening the door for massive expansion. As with all AR apps, it falls down when it comes to accuracy. One nice feature however is that it tells you how accurate it is at any one time, so you know how much to trust it. Another thing I like, is that unlike Sekai Camera it is displayed in Portrait mode, making it easier to use as a one-handed navigation device when walking. The recent debut of two such strong players is great news for AR development, and I expect that within a year we will no longer actually need to look at anything except our iPhones as we go about our daily lives. Thank you for stopping by. Read more about this site. The author can be reached on Twitter. You can follow the news on Twitter, Flipboard or RSS and discuss them on Google+ and Facebook. Yes, that's right, comments have been disabled here. There's also a self-help community where you can ask questions relative to anything mobile in Japan.